Cosmetic Acupuncture is a new introduction in the West, and offers a natural alternative to cosmetic surgery. Chinese doctors have been using points on the face for thousands of years to help combat signs of ageing and to help skin conditions. Cosmetic acupuncture, otherwise known as ‘facial rejuvenation acupuncture’ increases collagen production, and blood and lymph circulation to the face and scalp. Research has shown that acupuncture stimulates the flow of blood and energy through the skin in the face, thereby hydrating, boosting the skin’s supply of nutrients and oxygen, and thus reducing the signs of ageing. A 1996 report published in the International Journal of Clinical Acupuncture reported that among 300 cases treated with facial acupuncture, 90% had marked effects with one course of treatment. While not a replacement for surgery, Acupuncture Facial Rejuvenation is an excellent alternative. It is far less costly than cosmetic surgery and is safe, has no side effects or risk of permanent disfigurement. Unlike surgery that may have an extended recovery period with swelling and discolouration there is no trauma from Facial Rejuvenation Acupuncture. However, as with all treatments involving the use of needles there is a small risk of superficial bruising to the tiny capillaries under the skin. Bruising is not common and does not last long but needs to be borne in mind if choosing needle stimulation. Facial Rejuvenation Acupuncture cannot reshape one’s nose or chin, but it creates a subtle rejuvenation that takes years off one’s face safely and naturally while improving overall health. Facial points are stimulated using the finest, sterilised, disposable needles and supported with acupressure tuina with argan oil (gentle massage), derma roller, and Japanese warming techniques. Supportive needles may also be used elsewhere on the body to balance your constitution You may also opt for electro stimulation of the facial needles.. You may also include Zero Balancing bodywork with the above if you wish to have a longer full body and facial session. 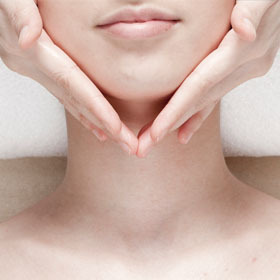 Facial Massage (45 mins: £45.00) No needles; Japanese warmer massage; derma roller: tuina massage with argan oil. Facial massage (60 mins: £65.00) With needles, with or without electro acupuncture: followed by Japanese warmer massage, derma roller, tuina massage with argan oil.